Sport and playing activities were first recorded when George Capron the land owner of Ringstead installed the first park in the village down Station Road/Addington Road corner (on the right if coming from Ringstead). Some people tend to think this was Ringstead's first football pitch, but it wasn't so, that was behind The Swan public house. Ringstead like any other village had its usual sports of football and cricket and even as a teenager I played football for Ringstead football club in the 1970s and enjoyed thoroughly it. But how far back does Ringstead football club go ? The information at the Records Office at Northampton indicates that Rushden and District Football League started up in 1887, but football was played in Ringstead earlier. 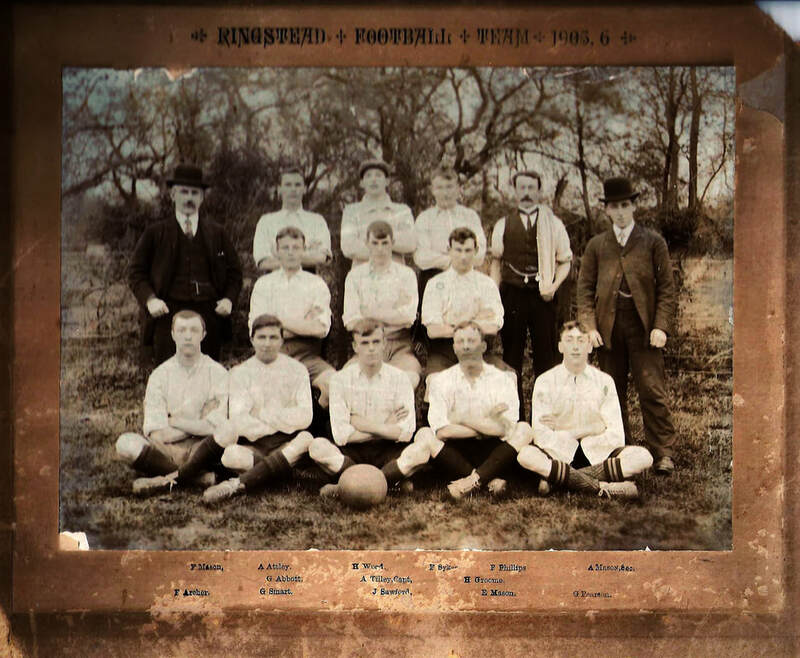 As to regards of one village or town playing another in the village, I have seen news paper articles where Ringstead All Stars are playing against Woodford Wanderers in 1883 at a Mr Ratcliffe's field in Ringstead. This would had been in a field behind The Swan public house at the bottom of then Shop Street (High Street as we know it). I have no exact date when the village football club started. It would have been around early 1800-1803 as again this is mentioned in the newspapers and Ringstead All Stars was the first named team. Their meeting place was The Axe & Compass where they would have got changed and then walked over the road into the field where the game would be performed. There are two football fields mentioned early on, one being behind The Swan pub and another field exactly where Cornaways garage was sited on the corner of Station Road and Carlow Road, now known as Kingfisher Close. In later years it moved to Gladstone Street Recreation Ground. Here is list of Ringstead football club names and close approximate years. Ringstead teams as a whole played in the Rushden and District league , Wellingborough District league started a little later. Today Ringstead Rangers are still playing as a club and meet up the Gladstone Recreation Ground where there is a club house/changing room. Below are pictures of Ringstead Football teams over the years starting with Ringstead Britons 1890 posing outside The Axe and Compass. The only recognizable person on this photo is Harry Cope, 5th from the left, the Ringstead shoe worker who murdered his two boys then committed suicide. Images taken in 1922 outside the Axe & Compass and 1905 taken down the meadow, photo from Paul Amos. 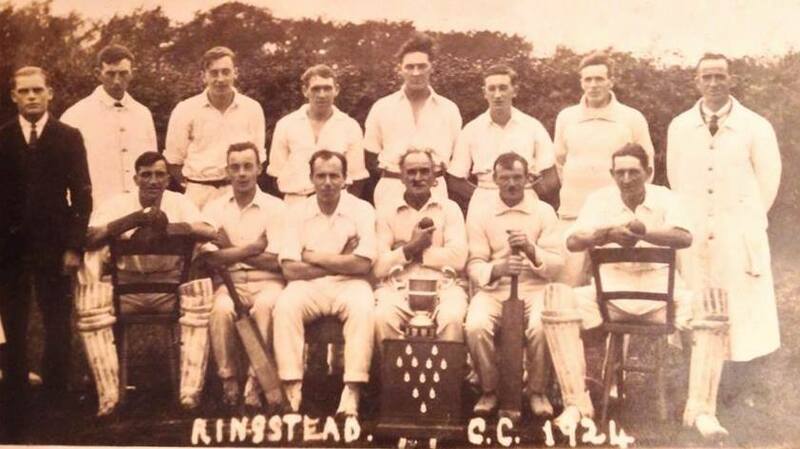 ​Ringstead Cricket club teams, 1924 and 1907 further below. William Dodson of Ringstead mill is seen at the front 2nd from right. Cricket Club Annual Supper—The first annual supper of the Ringstead Cricket Club was held in the National Schoolroom, at Ringstead, on Friday evening last, under the presidency of the captain, the Rev. E. A. Sandford, when 32 sat down to an excellent spread, the catering being done by Mr. John Knight. After the removal of the cloth, the usual loyal and patriotic toasts were given by the Chairman, and drunk with musical honours, as was also "The health of the Captain" which was enthusiastically received. The cricket field being in the meadows across from the Axe and Compass. The health and toast of Mr. Ratcliffe,(land owner) who had so kindly lent the cricket field, was next given. Mr. Ratcliffe being absent, the toast was acknowledged by Mr. Chew. The Chairman then gave "Success to the Ringstead Cricket Club," and congratulated the Club on the measure of success it had attained during the past year, and made some pertinent observations on the play, with a view to effect some improvement in the future. He expressed his regret at the serious accident that befell Mr. Bannister in the cricket-field, by which he lost one eye, and spoke of the very efficient services he had rendered to the Club, and also to the village as master of the National School. He thought both old and young were indebted to him, and he had the pleasant duty to perform of presenting him with a purse containing £8 3s. 6d., with the following address— "Presented to Mr. John Bannister by the members of the Ringstead Cricket Club and a few friends, as a small token of their esteem, and as an expression of their sympathy with him in the serious loss he has sustained by an accident in the cricket-field, on Sept. 13, 1882.'' In responding to the toast of the Chairman, Mr. J. Knight said he thought they might congratulate themselves on the success they had achieved in the cricket field considering it was their first year. They had played nine matches, five of which had been won, three drawn against them, and one in their favour. He remarked that if they wished to be more successful in the future they must pay more attention to fielding. With respect to the present to Mr. Bannister he said it had been his lot to take part in several public subscriptions, but he had never known one that had been so heartily and cheerfully responded to.—Mr. John Bannister, in accepting the purse, said he scarcely knew how to express his thanks to them for this proof of their sympathy. He had already felt that he had the sympathy of the members, and of everyone who knew of the accident, but he had no expectation of receiving any practical token of it. Beside the loss he had sustained, it had been attended by great expense, and therefore as the gift had been presented in such a kind manner he had great pleasure in accepting it. Above photo is the 1924 Ringstead cricket team with names of James,Sam Hackney, Bill Hawes, Ernest Gilbert, Ernie Hackney, Hugh Archer, Billy Dodson,B Farr, Herbert Dodson. In the 1930s it is recorded in newspapers that Ringstead had a tennis club and again used The Axe and Compass as its team name. Their tennis court was at the rear of the Manor House and both men's and women's teams played other villages and towns. Other sports such as hockey in the 1950s were played in the village and even the school had its own netball team over the years. The hockey matches at home were held at Tilcraft/Gladstone Street Recreation Ground. It is noted from a lady who played for the team that when the team played away to such teams as Northampton it was sheer heaven playing on really good pitches, much better than the Recreation Ground. The team was a mixed team and had such players as Bernard Freestone, Lionel Jacobs, Joy and Barbara Craddock and the Reverend Bryrant's sons and their daughter who in fact started the team up in 1964. Ringstead Institute was in a Billiard Team League in the 1930s. As a 12 year-old I can remember the big billiards table still being there then in the 1970s. Below are short write ups from the Mercury Newspaper . 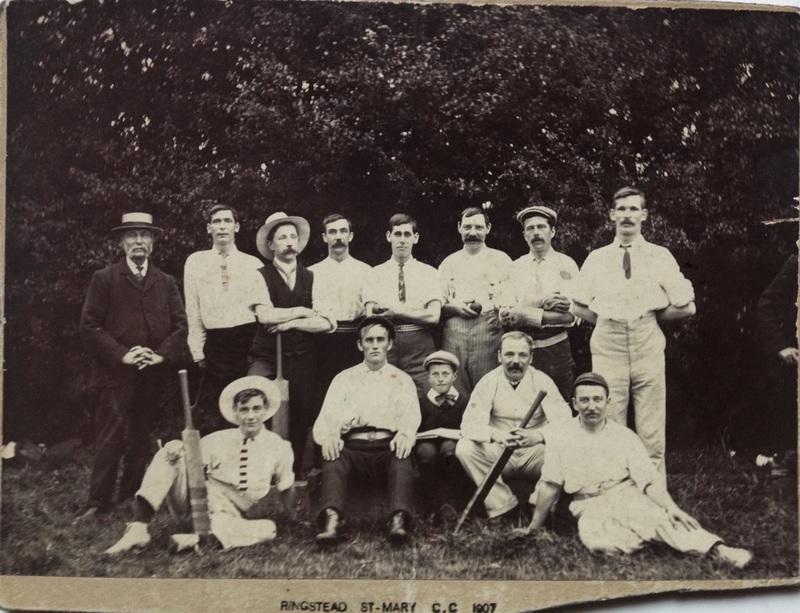 Note Ringstead had a Cricket team as early as 1868. The first village cycle club started in 1890 at shop street ,The cycle shop run by Henry Gaunt brother of Alfred Gaunt who ran Raunds cycle & motor cycle shop.The cycle club would meet outside the Swan Inn shop street and go for there weekend runs.Henrys shop would had stood opposite the present family store.